Women often carry the burden of incarceration, emotionally, spiritually, and financially. 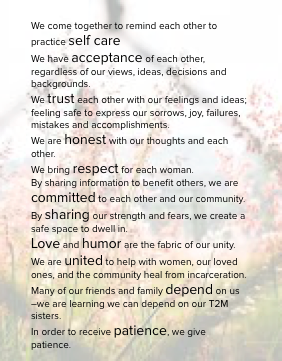 Talk 2 Me is a support group for women whose loved ones are currently or formerly incarcerated. We provide a safe, welcoming space for women to share their experiences and support each other. The Talk 2 Me group is a close-knit community that is based on values of love, understanding, and openness. T2M group meetings offer a relaxed environment for our members to share their stories and support each other with the challenges of supporting an incarcerated or recently released loved one. Our T2M group has joined together to create and reinforce a common system of values for the entire group. The Talk 2 Me group meets weekly, on Tuesday nights at All Souls Episcopal Church, beginning with supper at 6:00 and ending with the closing of the circle at 8:00. We are always welcoming new members!